I had a great time at this year's Walker Stalker Con at the Georgia World Congress Center, my second time at this particular convention! It is The Walking Dead heavy, but there's so much more! My friend Nikki is so much fun and such a great sport! 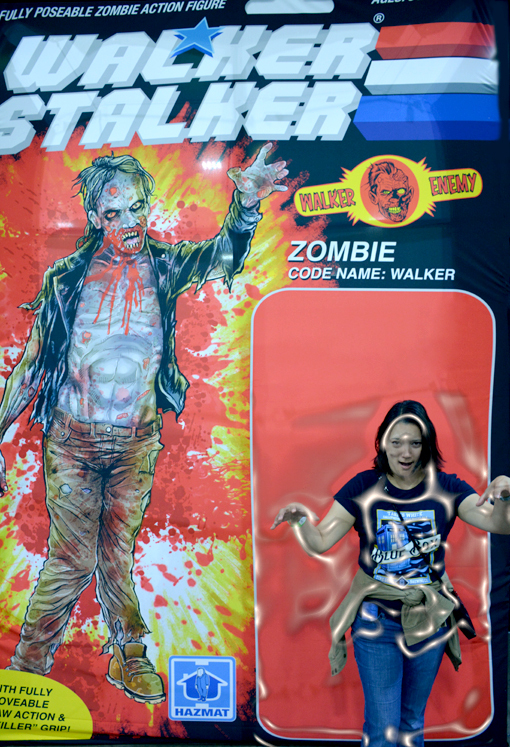 She posed here at the Walker Stalker Action Figure photo-op. I plasticized her to make it look a little more authentic, but you can see that no plastic is going to stop Zombie Nikki! Yes, that's a Doctor Who beer ad t-shirt...several other conventioneers commented on it and shared their Doctor Who fanaticism. We were in good company! 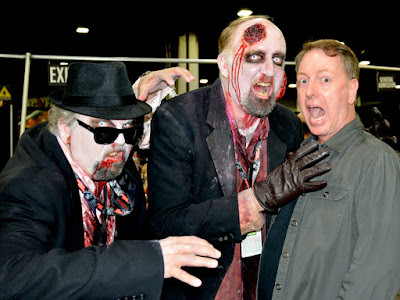 I got to see Stan the Zombie again this year, although my first photo with him was at a Zombie Night at an Atlanta Braves game! I've been following Stan the Zombie's adventures on social media and invite you to, too! Stan the Human is totally awesome, as well. 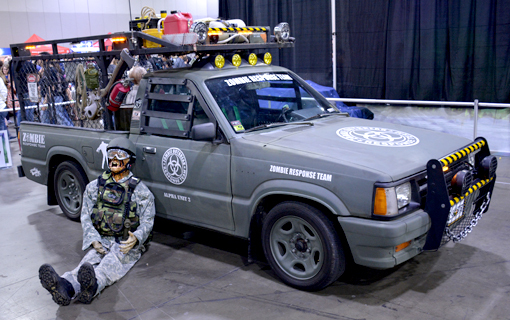 There are tons of experiences and photo-ops throughout the Con, including several zombie vehicles, some of them displayed in a diorama-style setting, some of them with zombies! I don't know who this guy is, but I've seen him at a number of conventions...he's always having a blast! If I find out and he has a public social channel, I'll come back and share it here. Again, Nikki was a total trooper! There was a Cosplay Contest the day we went. It's a three-day convention, but our schedules would only allow us to go that Saturday...lucky for us, we got to see the contest! Cruella de Vil—who was wearing bloody dalmatian fuzzy bedroom slippers—was a total riot! We talked with her for a few minutes at the end of the day and she shared that the Cruella cosplay was her daughter's idea, and that she had had great fun doing it. Shhhh...don't tell the ASPCA, please. 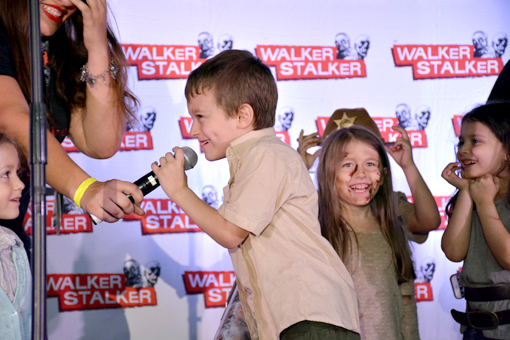 The most adorable team cosplayers was this group of The Walking Dead miniatures. There's a superstar or two in this group...they barely gave the mic back for the rest of the contest! Totally adorable! 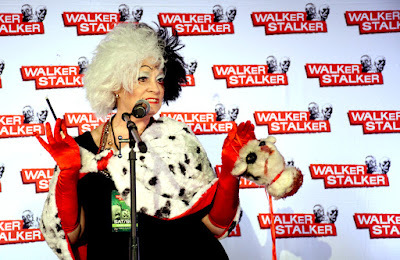 Most of the costumes in the contest were themed on The Walking Dead, segmented into "Walkers", "Stalkers" and "Other". As with most committed cosplayers, the costumes at this Con were brilliant! 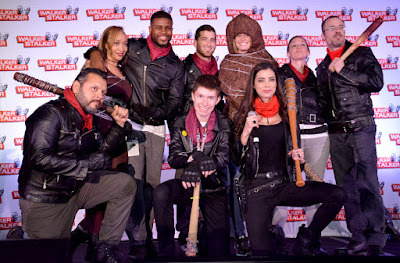 There were a LOT of costumes fashioned after a new villain on The Walking Dead, Negan and his freakin' scary sidekick Lucille. 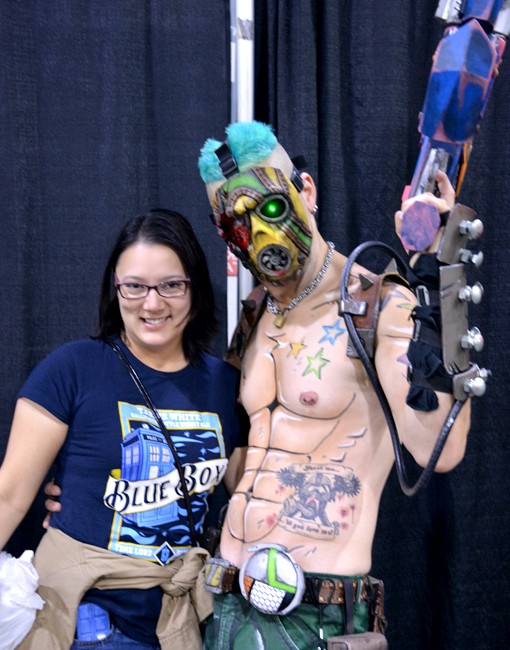 The cosplayers served up some incredibly creative renditions of the duo. There were so many Negan & Lucille cosplayers, in fact, including one of the judges—VAMPTRESS LeeAnna Vamp—that they were all called to the stage for a group photo! I'd share with you who the winners of the contest were, but that'd create a spoiler situation, and I know better than to do that! Oh, the precarious situations we find ourselves in during a convention...most of them fun, some of them more adrenaline-rising than others. 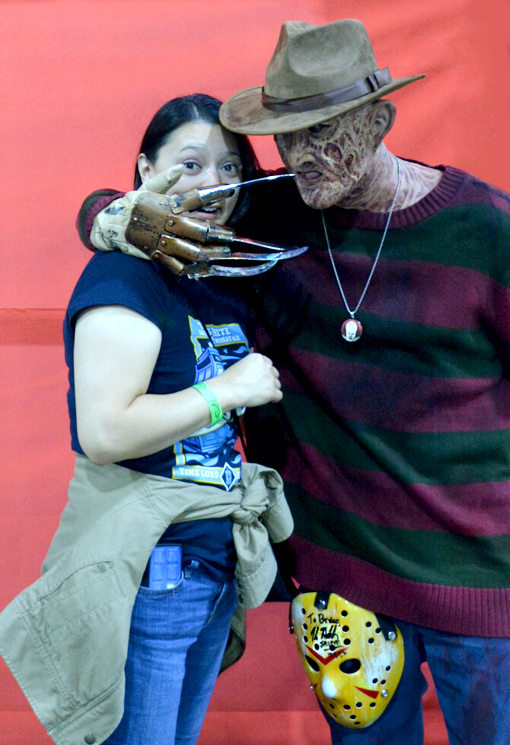 Freddy Kreuger was awesome! Nikki and I both made photos with him, but hers turned out the best. Of course. I didn't notice until I was editing photos that Freddy was wearing a necklace featuring the head of Pennywise the Dancing Clown...creepy! In addition to the tiny little bits that I've shared here, Walker Stalker Con also features panels, loads of vendors (I got a book from author J.H. Glaze! ), you can have your fortune told and you can get a tattoo—from a working tattoo artist! There are plenty of food and drink vendors, too—we had Jim'N Nick's Bar-B-Q for lunch! There were parties, too, including a Halloween party hosted by Tom Payne! AND Atalanta Movie Tours was doing special tours that departed from the convention site! Got to see my AMT friends Carrie and Cindy! Practically any and every actor who has been on The Walking Dead was there doing panels, autographs and high-end photo sessions, including Andrew Lincoln and Norman Reedus! I finished my Walker Stalker Con experience this year by meeting and getting an autograph from Ross Marquand, who is Aaron on The Walking Dead. Super, super nice person! 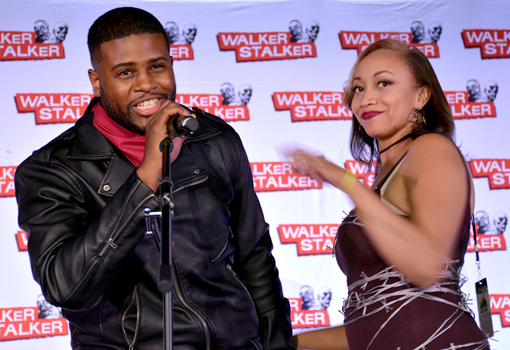 If you haven't been to Walker Stalker Con before, keep an eye on their website for when tickets go on sale for next year's event. See you then!